Gold prices hit a 1-week high today and steady they go. Since the price made a low of $1,046 back in 2015, it has never looked back. As of today, it is trading at $1,248. Having said this, the price is down by -4.05% year-to-date, but the daily chart shows that the trend is still skewed to the upside. The primary reason we saw some losses in 2018 was the hawkish monetary policy adopted by the Federal Reserve Bank. The Fed has increased the interest rates three times so far this year and another rate hike is firmly on the cards when the Fed meets on Wednesday. Another hike will push the interest rates in the U.S. to their highest level in a decade. These interest rates hikes have pushed the dollar index towards its peak point (97.71) for the year. In other words, the dollar index has had one dominant trend this year- the uptrend. The greenback and gold have an inverse relation. The reason we have not seen strength in the inverse relationship between the yellow metal and the dollar is mainly because of the feeble world economic growth. The tumult in Paris, the Brexit chaos and the trade war between Washington and Beijing have crippled optimism among investors. Going into 2019, the yellow metal is likely to shine more as cracks have started to surface in the U.S. economy. The U.S. equity markets are on track to record the worst performance in a decade. Trump can no longer brag about this. The housing market, a leading indicator to gauge the economic health of the country, is showing some serious concerns. Business investment has dried up in the third quarter and effects of tax cuts by Trump administration have almost vanished. Can the U.S. economy end up in recession in 2019? This is the question that many will be asking. Under the current circumstances, it may not be far stretched to say that if the recession doesn’t see the daylight in 2019, it is likely to see it in 2020. Having said this, it is vital to look back at history and see how they have dealt with a similar situation. 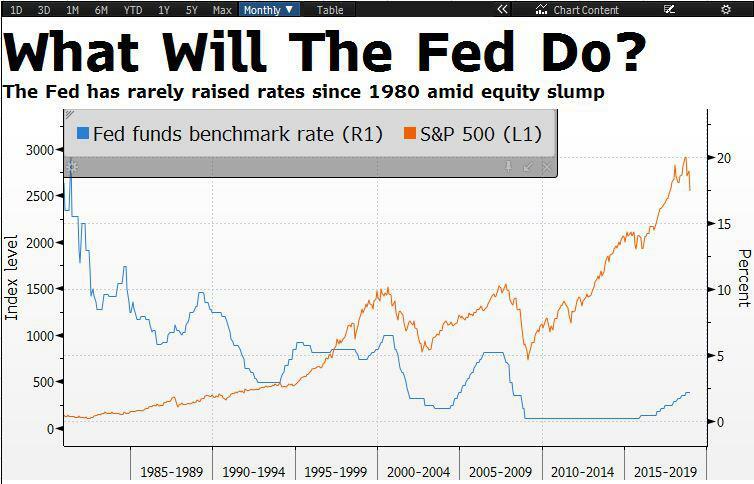 The below chart shows that the Fed has hardly increased the interest rate when the equity markets are soft. Investors and the Fed will be observing the economy very prudently and this will dictate the volatility for the gold price. 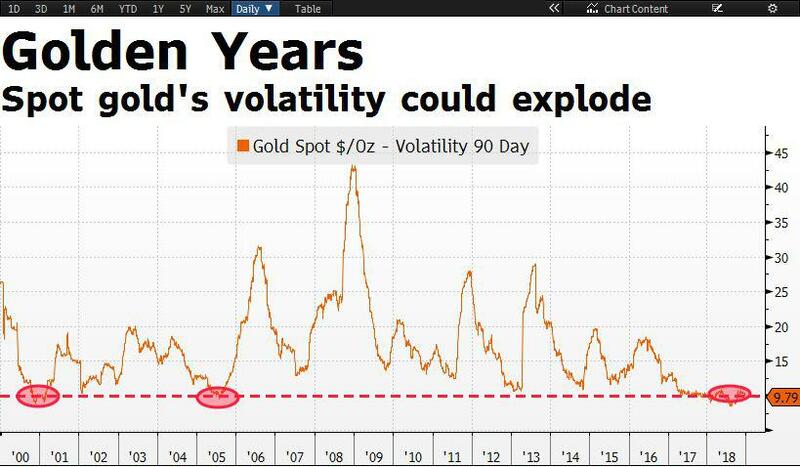 Looking at the historical chart of gold, it shows that volatility is ready to pop. The explosion in yellow metal’s volatility is due for some time as it is currently sitting at a historical low level. Investors are already worried about global growth and if these concerns change into a global recession, the above scenario can easily come in to play. All in all, it is highly likely that we will see an uptrend for gold and factors such as feeble economic growth, escalation in the geopolitics in Europe, the Middle East and stronger threats to Trump’s presidency could drive the price way above the $1600 mark in 2019. However, a controlled Fed policy and a stable economic growth may only push the price towards $1400. Gold (futures on Comex) moved-off six-month highs reached at 1270.20 in the US last session and now consolidates near 1265 region, awaiting fresh trading impetus for the next push higher. The 1%+ rally seen in the yellow metal a day before was mainly driven by an increased flight to safety, as the investors shunned risk after Fed’s hawkish twist aggravated US economic slowdown concerns and knocked-off the greenback amid a potential yield-curve inversion. The Fed hiked the interest rates for the fourth time this year on Wednesday while signaling “some further gradual” hikes. The fears over US recession triggered a sell-off in the global equities which further boosted the demand for the traditional safe-haven gold. Moreover, in evidence of increased investor confidence in gold, holdings of the SPDR Gold Trust, the world’s largest gold-backed exchange-traded fund (ETF), jumped to their highest level in four months this week. Looking ahead, the broader markets sentiment will continue to play a key role in gold’s price-action while markets await the US durable goods, core PCE price index and Michigan consumer sentiment data for further trading momentum, as volumes thin out into the Xmas holiday break. From the advent of the first blockchain technology, those within the financial sector knew things were about to change. Since the introduction of blockchain technology in 2008, it was often said that banking institutions around the globe were about to face a fairly tough time, that could even make them completely redundant and impractical. Consequently, several voices began to denounce the blockchain as the bank's enemy No. 1. However, it appears that for every person with a conservative mindset, there was also a forward thinker exploring the promising opportunities that were given to him. As IBM found in 2016, banks are adopting distributed ledgers much faster than anyone expected. Absolutely justifiably, since a wide adoption could save banking institutions up to $27 billion annually by 2030, according to a recent study by Juniper Research. The disruptive advancement that is called blockchain is conquering the financial sector. Let's find out what's happening and what role the Europeans have in it. Until the end of 2017, "pretty much everything had been experimental and prototypes. Production was something small and safe in the corner," said David Treat, head of Accenture's capital markets blockchain practice. But, since the beginning of 2018, it seems like the banking sector got down to business and actually started using the promising technological advancement. On May 14 this year, the banking giants HSBC and ING made the first real transactionon a blockchain between two banks. The purpose of this transaction was the trading of agricultural goods and it is considered a milestone for cross-border trading. We also saw a group of European banks completing the first test stage in a blockchain interbank reconciliations trial in October. Led by Italy-based Associazione Bancaria Italiana, 14 banks, including BNP Paribas, contributed two months of data to a Corda-based blockchain network. The original press release, delivered in Italian, mentions the establishment of the first phase as a "basis for subsequent synergistic implementations of DLT technologies," which also includes a form of smart contracts that will regulate the transfer of data. With ABI Labs at the helm overseeing a million test transactions between the banks involved, reports show that the performances were satisfactory, which will allow the process to move forward to the next phase. This cooperation between European banks comes on the heels of a project led by the Polish bank PKO Bank Polski, in partnership with the tech company Coinfirm, that will see blockchain technology utilized to notify customers about changes to product terms. The project, titled Trudatum, was described as a "breakthrough on a global scale" by Pawel Kuskowski, President of Coinfirm. All those success stories inevitably attracted the attention of the European Union. The association already announced in April that its members are invited to team up to research and experiment with blockchain technology in the so-called European Blockchain Partnership (EBP). Just a few weeks ago, the EU established a new blockchain forum that also invited at least five major European banks, such as Santander and BBVA. The EU Blockchain Roundtable's goal is "Bringing industries together for Europe to lead in blockchain technologies." There is an industry-wide reluctance to change. The financial sector is renowned for its slow implementation of technology, with many pointing to that hesitancy as one of the primary reasons for why it has fallen so far behind the curve. It could be possible that the real progress within the blockchain banking sector may be led by a platform outside of the traditional banking establishments. One such project is set to begin opening client accounts in December. Founded by former bankers of HSBC, Credit Suisse, Bank of New York and UBS, EQIBank is looking to turn the banking sector as we know it on its head, by offering the traditional services of a fully licensed, regulated bank in conjunction with the opportunity to manage traditional and crypto assets all within a single banking relationship. Services will include trading, lending, custody, settlement and clearing. At the official launch of EQIBank, CEO Jason Blick said that "there is a lot of market speculation about the delivery of a new generation of bank -- one that can bridge the worlds of crypto and national currencies. However, EQIBank is the only licensed, regulated bank that is operational and ready to receive applications for accounts." This falls in line with novel blockchain legislationcoming from Bermuda. This piece of legislation officially enables native banks to deal with new financial technologies. As Huhnsik Chung, a partner at Stroock & Stroock & Lavan LLP, with more than 25 years of legal experience in the financial services industry, put it in reference to the recent initiative: "It is often the case with new technologies and new lines of business, first movers will be well-positioned to attract a lion's share of the burgeoning fintech market." Since the introduction of popular cryptocurrencies like Bitcoin, banks around the globe obviously figured out that something needs to change. We have seen them form five international blockchain consortia and several other initiatives that all aim to push forward the trade finance sector. Yet, those advancements would often not affect the banking customers itself, although there certainly are some benefits that consumers might be interested in. With the recent news from Bermuda and real banking alternatives like EQIBank, the global banking industry might have a new, serious competitor that could completely disrupt their business in the near future. Following the ICO boom in 2017, along with Bitcoin’s all time high of nearly $20k last December, the cryptocurrency and blockchain industry has gone down a rocky road. As the crypto world is full of surprises, it’s difficult to predict what’s in store for the future. Yet it’s interesting to hear what industry insiders and some of the biggest influencers in the space have to say about their expectations for the crypto and blockchain industry over the next 12 months and beyond. Thinking of integrating blockchain into your business? I don’t blame you. Blockchain is primed to reshape many industries, promising huge rewards in efficiency, time and cost. This year, blockchain startups have received over $1.3 billion in funding from venture capitalists, with few signs of slowing. © 2018 TrustT. All Rights Reserved.